Did You Know I'm Also a Radio DJ? Click HERE to listen to "The Quiet Storm," my weekly two-hour mix of smooth jazz and soft R&B; that airs on WGDR-FM in Plainfield, Vermont every Thursday at 12:00 noon EDT/9:00 a.m. PDT/16:00 GMT. The influential evangelical minister who hosted a nationally televised presidential candidates' forum on faith and politics on August 15 at his California megachurch has been accused of lying about how his staff kept Republican John McCain isolated while Warren interviewed Democrat Barack Obama. 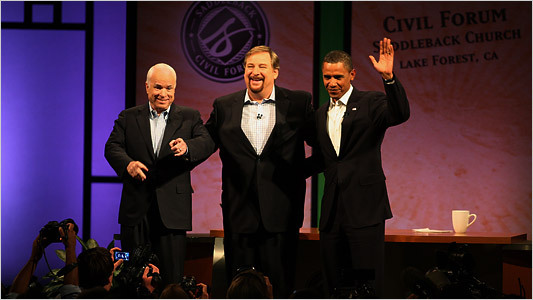 The Reverend Rick Warren, founder and senior pastor of the Saddleback Church in Lake Forest, had told viewers that the Arizona senator had been kept in a "cone of silence," unable to hear Warren's one-on-one interview with Obama, until the interview ended and McCain was invited to briefly appear on stage with Warren and the Illinois senator before Obama departed and the Southern Baptist minister began his separate one-on-one interview with McCain. But Warren's account is being sharply contradicted by actor-turned-activist Tom Laughlin -- best known as the karate-kicking hero of the "Billy Jack" movies in the late 1960s and early 1970s -- who has openly accused Warren of lying. In a lengthy and sometimes-rambling statement e-mailed Wednesday to The 'Skeeter Bites Report and posted on his Web site, billyjack.com, Laughlin says that McCain was running late for the forum and was still en route to Warren's megachurch while the pastor was interviewing Obama -- and either watched the interview live on a TV aboard his limousine or was kept abreast by Warren's staff of what was going on. An eight-minute video showing the now-77-year-old former action star reading his statement was attached with his e-mail to this blogger and was posted on both billyjack.com and in three parts on the popular video site, YouTube. "This is a very sad moment for me," Laughlin wrote. "Pastor Rick Warren, a deeply admired and respected hero of mine, knowingly, deliberately and consciously lied . . . and continues to lie and deceive us days after on [TV and radio] talk shows –- putting an ugly black mark on his incredibly great reputation, the incredible greatness and goodness of his wonderful book, The Purpose-Driven Life and the incredible great work he’s doing all over the world." "[But] he [Warren] never did any such thing," Laughlin charges. "Nor did anyone on his staff do it and report to Warren that McCain was safely in the ‘cone of silence’ -- for the simple reason McCain was not even there." Laughlin writes that McCain had not arrived at Warren's megachurch until 30 minutes into the pastor's interview with Obama. "There is no possible way that anyone on [Warren's] staff could have informed Warren that McCain was safely in the cone of silence . . . The only possible thing his staff could have told Warren is that they were getting panicky because McCain hadn’t yet arrived, and they had to go on the air in minutes. "Warren himself had to panic about the no-show of his major player –- unless he was aware of it and prepared for it," Laughlin continued. "Yet with everyone panicking that McCain had not yet arrived, and they were going on the air, with everyone desperately trying to locate McCain and get him there, Warren goes out and does an ugly, sinister thing. Warren tells the world audience . . . that 'we have safely placed Senator McCain in a cone of silence.'" Laughlin accused Warren of of knowing "with absolute certainty" that McCain was still en route to the forum while Warren interviewed Obama. "McCain was in a motorcade, in a car where McCain could hear everything –- on the car’s TV screen, on the radio, or have aides tell McCain of the questions being asked on his cell phone, blackberry, or any other message center," Laughlin wrote. "Not only could McCain hear the questions, his aides had plenty of time to prepare his answers," Laughlin charged. When McCain finally arrived "a half hour into the show," Laughlin writes, "he was put into a 'green room' in a separate building where Warren insists they unplugged the TV set, ignoring the fact that in the green room McCain, or his aides, could have cell phones, Blackberries and written and verbal communication by his aides who were with him." "That is patently absurd," Laughlin says. "So absurd it would be laughable if it didn’t have such serious repercussions on the presidential race." Appearing last Monday night on Fox News Channel's "Hannity & Colmes" talk show, Warren -- who already had come under fire the previous weekend from Democrats and from liberal bloggers alleging that McCain had been briefed about the pastor's interview with Obama -- acknowledged that McCain did arrive late for the forum, but dismissed the accusations as "totally bogus." Warren told the show's conservative co-host Sean Hannity that accusations of McCain knowing his questions to Obama in advance were "challenging the integrity of the Secret Service, challenging the integrity of -- my security staff, and challenging the integrity of John McCain of which both Barack and John agreed to the terms right up front." Warren insisted that there was "no way" that McCain could have heard his questions to Obama. "The fact is that John McCain did get there a little late, and the truth is, I actually got to tell Barack Obama about one of the questions in advance that I didn't get to tell John McCain about because he wasn't there," he said. The Southern Baptist minister told Hannity that he intended to tell both candidates "about my challenge to ask for a commitment regarding orphans. . .because [McCain] hadn't arrived when we went on stage. [McCain] didn't get to hear that question, so actually, it was [Obama] who got a question answered in advance, and John McCain did not." Asked by the program's liberal co-host Alan Colmes if he blamed the Obama campaign for the accusations that McCain was secretly briefed about his interview with Obama, Warren said the he didn't know, but that "I do know that somebody was systematically calling around telling people McCain [was briefed]." "Well, that was absolutely impossible," Warren continued, "because two days before we even set that up, Chuck Taylor, one of my staff members, went in there, totally disconnected it from the source, so if they had turned on that monitor, if anybody had have turned it on, all they would have gotten was static." But Laughlin isn't buying Warren's explanation. "First of all, who gave the instructions to the Secret Service to not let McCain or any of his staff with him in the car turn on the radio, take away his cell phone, Blackberry and iPod?" he demanded to know. "Not only McCain’s, but everyone in the car with McCain. Did those instructions come in a memo form, or given verbally? And by whom? The Supervisor of McCain’s Secret Service contingent? It’s beyond ludicrous that Pastor Warren is out there days later insisting that was the truth, what really happened." Laughlin ridiculed Warren's explanation as "totally misleading and deceptive regarding the nature of the friendship, the relationship that develops between members of the Secret Service and the candidates they are putting their lives on the line to protect." Warren acknowledged that it was "silly" of him to tell his audience that McCain was kept in a "cone of silence," but insisted that he and his staff knew that when McCain finally arrived, "the Secret Service was with him the entire time, and then they put him immediately in the other building, so I wasn't even sure that he hadn't arrived by the time we were moving on stage." Warren said he knew "probably 10 minutes" before airtime that McCain was running late, but he assumed that McCain had arrived by the time he and Obama walked onto the stage. When asked by Hannity for his appraisal of the two candidates, Warren called Obama "the 'thoughtful, consensus builder.' He is -- he likes to [get to the] nuance of things and think about the different implications. He's a constitutional attorney, and [for] a lot of people, that appeals to them." On the other hand, Warren said, "McCain is the happy, you know, straightforward, warrior, the commander. And his answers were bam, bam, bam, and I think that appealed to some people, too, and it was really just a matter of personality." The 54-year-old Warren, a native of San Jose, California, is the son and brother-in-law of Baptist ministers. His sister, Chaundel, is married to Saddleback's associate pastor, Tom Holladay. According to Warren, his call to full-time ministry came as a 19-year-old student at California Baptist University in Riverside when, in November 1973, Warren and a friend skipped out on classes and drove 350 miles to hear the Reverend W. A. Criswell preach at the Jack Tar Hotel (now the Cathedral Hill Hotel) in San Francisco. Warren stood in line to shake hands with Criswell afterward. Saddleback's first public service was held on Easter Sunday, April 6, 1980, with two hundred people in attendance at the Laguna Hills High School Theater. Under Warren, he church has grown rapidly, using nearly eighty different facilities in its 28-year history. When the current Lake Forest campus was purchased in the early 1990s, a 2,300-seat plastic tent was used for worship services for several years, with four services each weekend, until its permanent sanctuary, with a seating capacity of 3,500, was completed in 1995. Warren says he no longer takes a salary from Saddleback Church and has repaid all of his salary from the last 25 years, citing the success of his best-selling book, The Purpose-Driven Life. He says he now "reverse tithes," giving away 90 percent of his income to the church and living off of the remaining 10 percent. Laughlin's accusations against Warren have put him back in the national spotlight after nearly 30 years of relative obscurity. Laughlin began his on-screen acting career in the 1955 feature film "Climax!" From there he went on to appear in numerous feature films including: "These Wilder Years," "Tea and Sympathy" and "South Pacific." He also appeared in several episodes of various television series throughout the late 1950s and 1960s, including "Gidget," which launched the career of actress Sally Field. Laughlin's first starring role was in Robert Altman's 1957 film "The Delinquents." He made his directorial debut three years later with "The Proper Time." In 1963, Laughlin was the editor of the cult science-fiction classic "The Slime People." He was also the writer, director, and star of "The Young Sinner" in 1965. But it was his recurring role as the crusading martial-arts fighter Billy Jack in the late 1960s and early 1970s that made Laughlin a household name. In 1967, under the name T. C. Frank, Laughlin directed and starred in "The Born Losers," which first introduced the world to Billy Jack. He followed this up with the highly successful sequels, "Billy Jack" and "The Trial of Billy Jack," both politically-charged films co-starring Laughlin's wife, Delores Taylor, as Billy's companion, Jean, that, much like "Easy Rider," stunningly captured the mood of the turbulent '60s. But a decade later, the third film in the "Billy Jack" series, 1977's "Billy Jack Goes to Washington," was a critical and box-office failure. He also directed "The Babysitter" (1969), as well as "Weekend With the Babysitter" and "The Touch of Satan," both released in 1971. Laughlin has continued acting, appearing in such features as "The Big Sleep" and "The Legend of the Lone Ranger." In recent years, Laughlin -- who turned 77 on August 10 -- has turned his attention to politics, an arena that has always interested him. In 1992, he sought the Democratic nomination for president and appeared on primary ballots in New Hampshire and Louisiana. He campaigned on a platform of a tax cut for "ordinary Americans," term limits, an overhaul of public education, and universal health care. Despite being excluded from debates by party officials who did not consider him a serious candidate, Laughlin received 3,251 votes, or about two percent, in the New Hampshire primary. He ran for president again in 2004, this time as a Republican. Campaigning as an outspoken opponent of the Iraq war, Laughlin received 154 votes in the New Hampshire GOP primary. In addition to his strident opposition to the Iraq war -- which he compares to Vietnam -- Laughlin also devotes several pages of his Billy Jack Web site to reasons why President Bush and Vice President Cheney should be impeached, and to repeated calls for the establishment of a viable third major political party. SPECIAL ANNOUNCEMENT TO READERS: In response to many reader requests, The 'Skeeter Bites Report is expanding to twice-a-week publication. Beginning September 8, new articles will be posted every Monday and Thursday. You can also subscribe to the 'SBR by e-mail, thanks to FeedBlitz.com. Just enter your e-mail address in the "Subscribe by E-Mail" box in the left-hand column of this page and FeedBlitz will send you an e-mail alert each time a new article is published. Those of you who currently receive the weekly e-mail alert that I personally send out will receive the FeedBlitz alert in its place on that date. Meanwhile, the Labor Day edition of the 'SBR will be published three days ahead of the holiday, on Friday, August 29. Cone of Silence? Missed it by that much!